Galician preacher; died in 1664 at Constantinople. He was educated by Nathan Shapira, rabbi of Cracow, and was appointed preacher of that city, where he spent most of his life. He ultimately left for Jerusalem, but died at Constantinople. 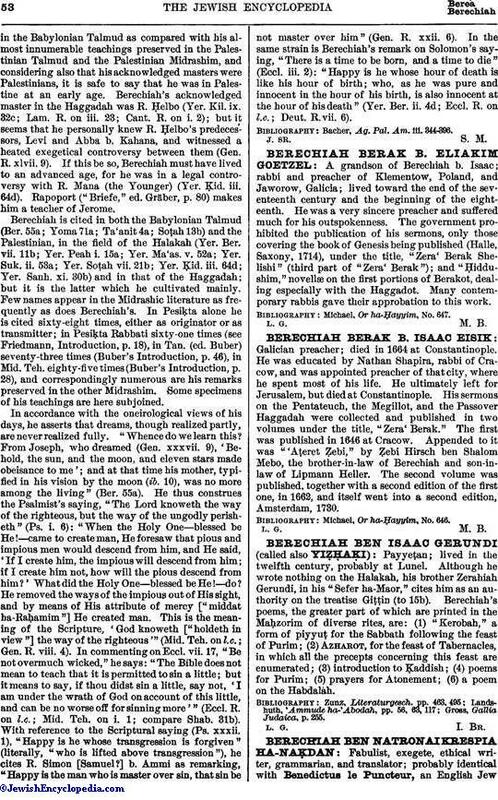 His sermons on the Pentateuch, the Megillot, and the Passover Haggadah were collected and published in two volumes under the title, "Zera' Berak." The first was published in 1646 at Cracow. Appended to it was "'Aṭeret Ẓebi," by Ẓebi Hirsch ben Shalom Mebo, the brother-in-law of Berechiah and son-in-law of Lipmann Heller. The second volume was published, together with a second edition of the first one, in 1662, and itself went into a second edition, Amsterdam, 1730. Michael, Or ha-Ḥayyim, No. 646.